I also wanted to circle back and share some new traditions in the making, and also the sweet ones we’ve continued. This year, we’re going to try ice skating, attending Christmas Eve service, and inviting family over on Christmas Day for brunch. I’m genuinely curious: What does everybody else do on Christmas Eve and Christmas Day? I just know that it always felt a little too quiet on Christmas Day, and that I wanted to fill the house with loved ones… so this year I thought we’d invite our family over! 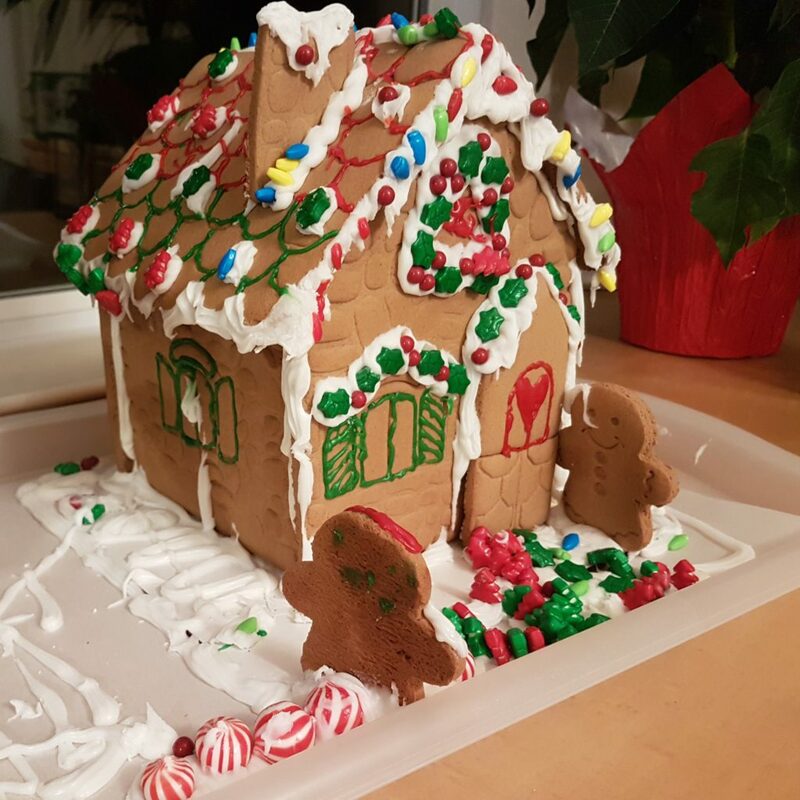 As for traditions we have continued, we are definitely still doing gingerbread houses. Costco’s $10 kit keeps it easy and makes for a nice evening activity with the kids. I was originally planning on letting each child decorate their own house, but we ended up working on one all together and that was a lot of fun, too. Plus, I don’t think my hands could handle squeezing out another tube of icing for another house. Last year, our neighbors were in the process of getting their home rebuilt so she put the gingerbread men on the roof to do repairs. This year, they are firemen, no doubt influenced by her admiration of the heroic firefighters that battled the Santa Rosa fires earlier this year. One is riding in on a peppermint firetruck while the other opens the door. Another tradition we’re keeping is experiencing a reenactment of Jesus’ birth story, which my daughter has been asking about ever since the first Christmas lights began to twinkle at night. She loves visiting Bethlehem and we can’t wait to bring her again soon. For next year, there were two ideas in this season’s Magnolia Home Journal that I liked. The first was driving out to find a good stargazing spot (armed with a thermos of hot cocoa!). The second was to host a “My Favorite Things” gathering with a few good friends. The idea is to invite a few friends over for a little grown-up gift exchange. Each guest chooses one of their favorite things from the past year and buys one for everyone else. They wrap each one up nicely and bring their bundle of treasures to the party. After enjoying some yummy snacks and wine, everyone takes turns sharing what they picked to gift before passing it out for others to open. I like this idea for many reasons. First off, it’s a fun little party just for the grownups, which feels calm and elegant in a way that loud and boisterous family parties, however lively, can’t provide right now. Secondly, you don’t have to think too hard about the gift-giving. You pick one of your favorite things and then buy several of them. Boom. Done. It’s not as personal, I guess, since you’re not spending a ton of time thinking about a personalized gift for each friend… but it’s also more personal in a way because you can take the time to explain why you loved this spatula (or book or K-beauty treasure) so much and why you hope everyone else will love it this year. Thirdly, I like the idea of these cute bundles of gifts all nicely wrapped. It just sounds pretty. And finally, yummy snacks. My friend’s friend used to post photos on Facebook of these elaborate dinner parties. They were like really fancy potlucks, where each guest would bring some outrageously elaborate course and everything was served in the style of a fine dining restaurant. You could tell a lot of thought was put into each course, from the appetizers to the dessert. The plating was lovely and the table was beautifully set and everyone dressed nicely and I really, really wanted to be invited. Since I am not up to hosting an entire dinner requiring so much flatware, a smaller “My Favorite Things” gathering could be a good excuse to make some delectable appetizers that I’d probably otherwise not spend the time or ingredients on. What do you think? Does that sound fun? What would be your “favorite thing” to share with friends? I love the magic of the holiday season, and I love that it’s a time dedicated to thinking about meaningful things like Jesus and family and friends. I hope you like some of the ideas shared here, and I’d really love to hear the ways you and your families celebrate each year and what brings you joy during this time! Our favorite holiday traditions include: several random acts of kindness, one new personalized ornament for our tree (something that sums up the biggest event of our year), retelling the story of our little family as we put each personalized ornament on the tree, a video message from Santa (if you’ve never checked out the Portable North Pole app, you must! ), Elf on the Shelf (I go all out with the elf), Christmas Eve dinner at Buca’s with my family and then a surprise homemade dessert and gift exchange at my house after, and Christmas Day dinner w Michael’s family. I am exhausted just typing this, but I love making so many great memories with my kids. Whew that does sound like a lot, but boy I bet those are going to be some amazing memories in the years to come! Thank you for sharing. I really like the idea of a new personalized ornament each year 🙂 That’s so special!